Mdf® Instruments Usa. All Mdf® Instruments Are Latex-Free" Free-Parts-For-Life Mdf® Stands Behind Its Quality And Performance With A 2-Year Manufacturer'S Warranty. Acoustic Tubes Are Constructed Of Non-Cracking, Non-Sticking, High-Density, Latex-Free Pvc. 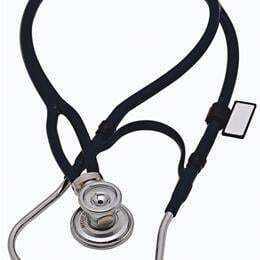 Stethoscope Accessories: Additional (2) Comfortseal Eartips, (1) Ultrasensitive Diaphragm And (1) Id Tag. Mdf® 2-In-1 Deluxe Sprague Rappaport Stethoscope. The Advanced X-Configuration Acoustic Tubing On The Mdf® 767X Eliminates All Tube Rubbing Noises Associated With The Traditional Sprague-Type Stethoscopes And Provides Maximum Acoustic Performance Making It One Of The Most Advanced Sprague Rappaport Available Today.The Chestpiece Enables Users To Switch Between Adult And Pediatric-Sided Bowels/Bells With Ease And Interchange Both Sides Of The Chestpiece With Adult, Pediatric And Infant Fittings (2 Diaphragms And 3 Bells). The 2-In-1 Tubes In The X Configuration Converge At The Middle Of The Tube And Retain A Dual Lumen And Dual Input From The Chestpiece. This Innovation Provides Superior Acoustic Quality Never Available Before On A Sprague Rappaport-Type Stethoscope. Navy Blue.